The BAZER Range of high performance bucket elevator chains, designed especially for service in cement plants, provides the highest and ultimate fatigue strengths for this application. As an added feature, barrier seals in BAZER Chains help prevent abrasive materials from entering and attacking the chain joints. BAZER Chains are exclusively manufactured at world class chain facility in the United States. The BAZER 956 chain can be used as a replacement for all Bucket elevator applications using 856 and 956 chains. The BAZER 956 chain with K24 attachment operates on the existing Traction Wheel and the existing buckets can be mounted on the chain. Chain No. Pitch Attachment No. Bushing Pin Avg. Wt. 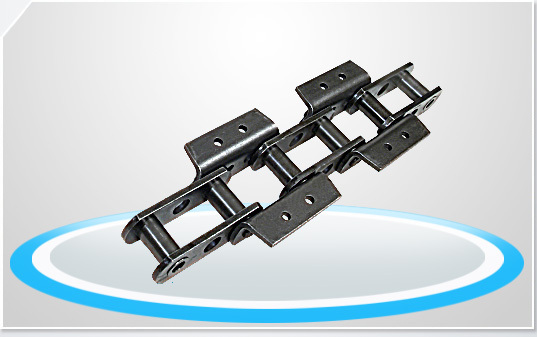 These BAZER Chains (956, 958 and 984) are made of specially selected 100% alloy steel and they possess ultimate strength ratings significantly higher than any competitive brand. A specially developed piercing technique makes exceptionally smooth pitch holes for high interference fits. This piercing method, combined with shot peening, yields maximum fatigue strength and protects against failure, even when the chains are challenged by the most severe applications. Extra deep induction hardening of pins and carburizing of bushings provides unsurpassed wear life. After extensive testing, an appropriate high-hardness specification was developed to resist abrasion caused by cement. A specific level and depth of hardness is produced and carefully checked to ensure that BAZER chains provide the maximum wear and toughness necessary to survive extended periods of service in cement plant bucket elevators. The BAZER Range of high performance bucket elevator chains, designed especially for service in cement plants, provides the highest ultimate and fatigue strengths for this application. As an added feature, barrier seals in BAZER Chains help prevent abrasive materials from entering and attacking the chain joints. BAZER Chains are exclusively manufactured at world class chain facility in the United States. The BAZER 958 chain with K44 attachment is a direct replacement of the 857-K44 attachment chain and the 958-K44 attachment chain. The BAZER 984 chain with K443 attachment can be used for all applications using 864-K443 and 984-K443 chains and can be operated with the existing traction wheels and buckets.